Now that Deputy Attorney General Rod Rosenstein and Special Counsel Robert Mueller have indicted the Russian government spies who hacked the 2016 election and are ostensibly moving in on Donald Trump’s inner circle, Trump’s Republican allies in the House of Representatives are taking aim at Rosenstein. 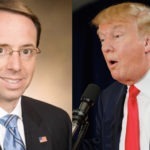 Two GOP Congressmen are vowing to start the impeachment process against Rosenstein on Monday. There is no chance of Rosenstein being removed via impeachment. Literally none. However, Trump and his allies are in danger of scoring a different kind of victory here. We don’t know precisely how far the impeachment process against Rod Rosenstein might go before it fails. Will the other House Republicans vote to allow impeachment hearings? Probably not. Only ten percent of the House GOP would have to vote “no” for it to fail, and those from moderate districts wouldn’t want to marry to themselves to something that could be used against them by their opponents in November. But even if the impeachment of Rosenstein somehow got out of the House, only the Senate can vote to convict and remove someone. There would not be even close to 67 “yes” votes in the Senate. For that matter, there wouldn’t even be 50 “yes” votes in the Senate. Not even close. The whole thing would get promptly laughed out of the Senate, and Rosenstein would keep his job. It’s not that the odds of Rosenstein being removed via impeachment are remote; it’s that they’re literally and precisely zero. No, Mitch McConnell can’t magically change the impeachment rules to only require a simple majority – and even if he could, he wouldn’t have the votes for a simple majority. No, the House impeachment effort against Rosenstein isn’t going to magically soften up the ground so that Trump can fire Rosenstein and magically get away with it. It’s simply not happening. Even Trump’s House allies know this. So why are they pushing forward with it? Because they know you’ll pay attention to it. The effort to remove Rod Rosenstein is guaranteed to fail. He will not be removed. But based on the sheer number of panicked members of the Resistance who’ve been asking me about it over the past few days, it’s clear how much of a distraction this has become – and that’s the whole point. If you’re focused on the imaginary scenario in which Rosenstein is removed by Congress, then it means you’re not focusing on Trump’s secret meeting with Putin, or the immigrant kids still locked in cages, or any of the other things that Trump doesn’t want you paying attention to this week. So if you waste even one minute this week focusing on the imaginary narrative about Rod Rosenstein being removed from office, then you’re handing a victory to Donald Trump by letting him off the hook on all his real scandals. The mainstream media can’t resist the opportunity to cash in on huge ratings by scaring you into believing that Rosenstein might actually be in trouble. So the major media outlets will spend the week feeding you histrionic doomsday nonsense, while hoping that you forget how to count to sixty-seven votes. This is the same mainstream media that’s spent the past year periodically trying to scare you into staying tuned in by insisting that Donald Trump was about to fire Robert Mueller and magically get away with it, or that Trump was about to pardon everyone and magically get away with it, when there was never one bit of evidence to support either of those imaginary narratives. It’s the same story here. There is literally zero chance of Rod Rosenstein being removed from office. But if you pay attention to this impeachment circus at all, you’ve giving Trump what he wants: a distraction. This is going to be an ideal week to turn off cable news entirely.